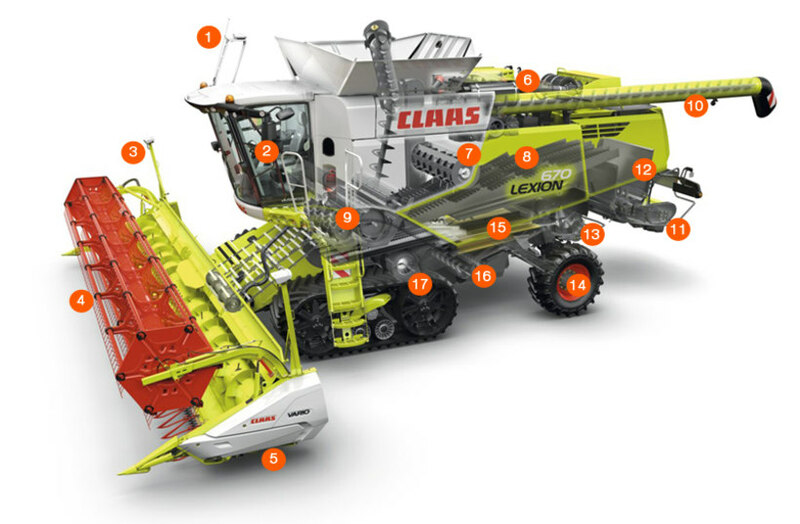 The LEXION with APS threshing system and effective straw walker technology. More powerful, more productive, more flexible, more comfortable, more profitable: harvest more. It is now possible for the task of changing over from swathing to chopping as well as adjusting the static knife array and the rasp bar in the straw chopper to be performed from the cab. 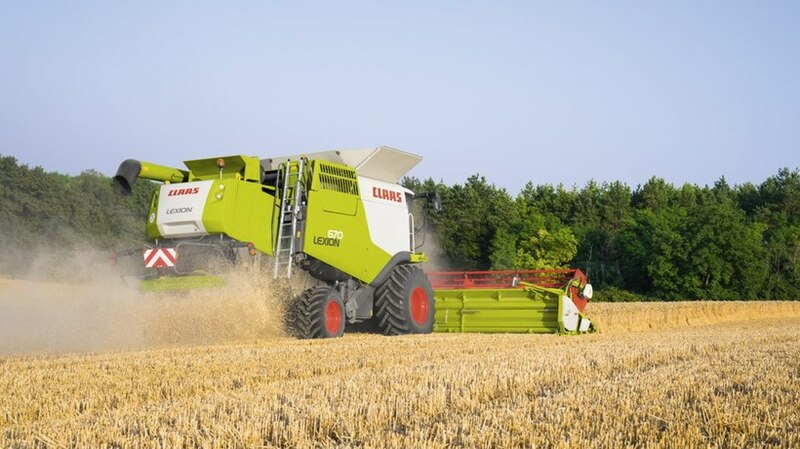 Thanks to the increased diameter of the new straw chopper, the chopped material is accelerated to a significantly greater degree and the spreading quality is optimised. A shallow intake angle to the threshing parts facilitates optimal crop flow. Rugged intake chains or belts with feeder slats ensure high stability while a replaceable wear plate guarantees long service life. 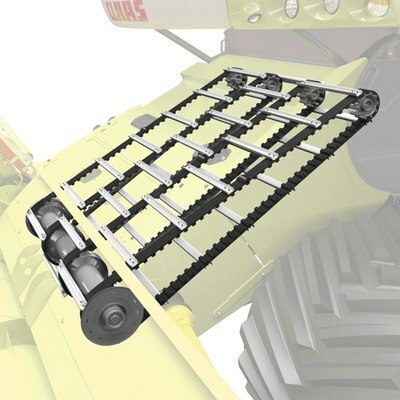 The HP (header pitch) feeder housing allows manual adjustment of the cutting angle to adapt to all field conditions. From the central position the cutting angle can be moved 8° back and 11° forward. The mechanical adjustment is performed by means of a top link on the feeder housing. With the flexible positioning of the cutterbar mount, the V channel facilitates fast and easy mechanical adjustment of the cutting angle, even with a front attachment fitted. 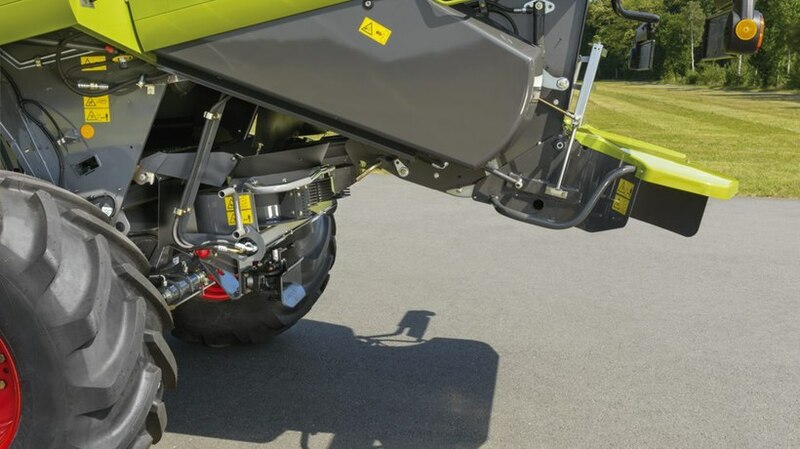 This ensures optimal adaptation to all field conditions and different types of tyres. The cutting angle is adjusted from one central point and transmitted in parallel to both sides. The cutting angle can be read on a scale. 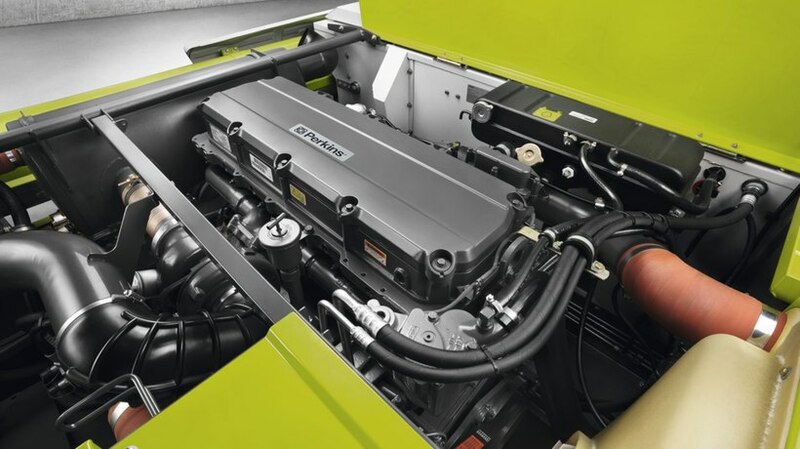 Thus there is a net performance increase of up to 20% with no rise in fuel consumption. 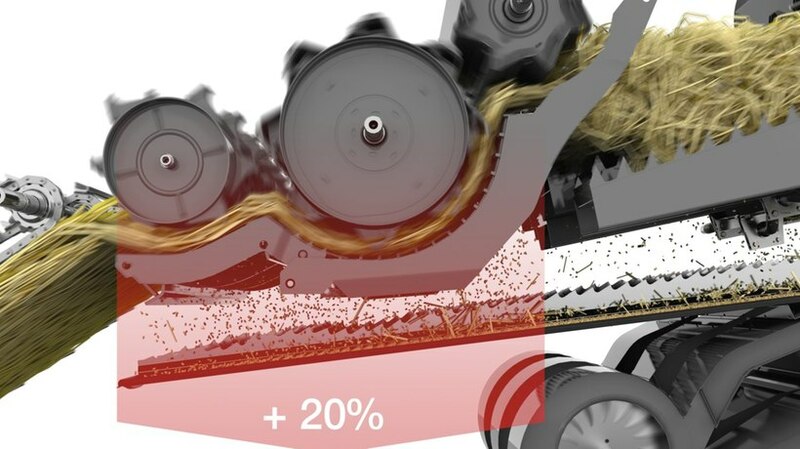 The APS threshing system operates so efficiently that only about 10% of the grains run through the residual grain separation stage in the LEXION. 90% of the grains have already been separated from the straw by APS. 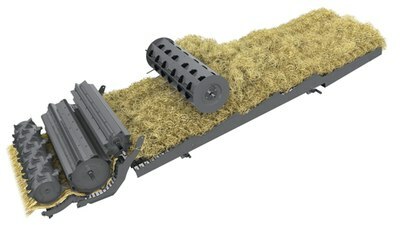 The even flow of straw on the open-bottomed straw walkers with an extreme gradient angle ensures that practically all the grain is separated from the straw. A separate returns pan sends the grains on their way to the preparation floor. Residual grain separation occurs on a total length of 4400 mm across four straw walker steps. The LEXION 670/660/650 models are equipped with six straw walkers and the LEXION 630/620 models with five. Centre and side extensions are available. Even large volumes of straw are transported quickly and easily. 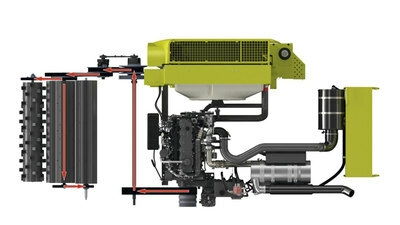 Thorough loosening of the straw mass is critical for high separation efficiency, particularly under difficult field conditions such as wet straw or green growth. This is why all LEXION straw walker combines are equipped with the multifinger separation system (MSS), a drum with controlled tines positioned over the straw walkers. It ensures effective residual grain separation under all conditions. Together with the AUTO CONTOUR, it is the ideal "hillside package"
The fill level and composition of the returns enable conclusions to be drawn about the best equipment settings to use. The cab also enables the operator to view the well-lit returns directly whilst seated. 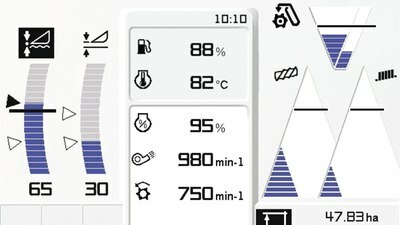 In all LEXION models, the fill level indicator can be complemented by the GRAINMETER. The electronic returns quality display also allows convenient checking of the proportion of grain in the returns in CEBIS. 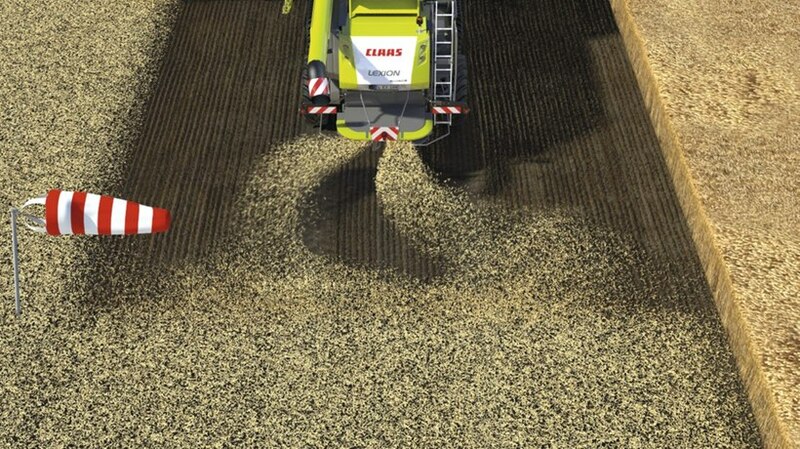 This data enables the operator to optimise the equipment settings manually to utilise the full production capacity of the LEXION. The image from the camera fitted on the rear hood is fed straight to the CEBIS screen. There is no need for an additional screen in the cab. The image from the camera is displayed automatically on the CEBIS screen as soon as the multifunction control lever or CMOTION is used to move the LEXION backwards. It is also possible to use the DIRECT ACCESS button to call up the image from the camera. More performance. More convenience. The straw chopper. Sometimes, bigger is better. Crop intake and transport are improved significantly by the increased diameter of the straw chopper. 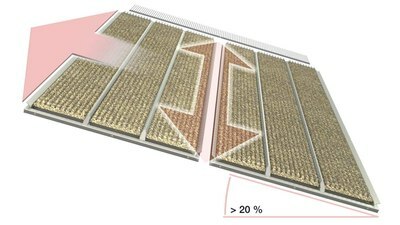 The extended floor of the straw chopper increases the duration of the transit of the chopped material and accelerates it to a significantly greater degree. When used with the standard deflector, this increases the projection distance and spreading quality drastically. From the straw walkers, the straw moves directly to the chopper, which can be varied in intensity depending on the operating conditions. Up to 88 closely arranged dual bladed knives, a cross blade and a static knife array are the recipe for finely chopped straw. The LEXION also has a swivelling grating element for the best straw chopping and spreading. The finely chopped material is subsequently fed to the power spreader. Getting out the cab is now history, at least when it is a matter of switching over the straw chopper from swathing to spreading chopped material. This task can be performed effortlessly from the cab via CEBIS. 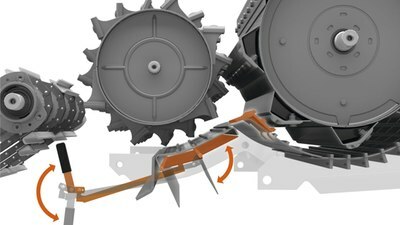 If chopping is required for only certain parts of a field, the operator can switch the machine over in a matter of seconds. Perfect straw spreading of the highest quality is guaranteed by the mechanically driven power spreader. The two counter-rotating spreading rotors are driven by a belt and therefore always run at a constant speed. 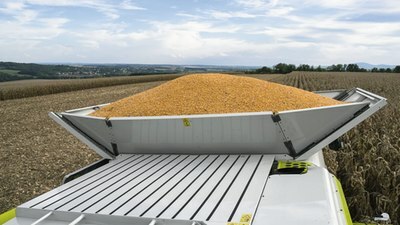 This unique drive concept ensures consistent spreading quality. Each spreading rotor has two movable deflectors whose spreading width can be adjusted either together or separately. This allows the system to be adjusted to any conditions encountered in practice. 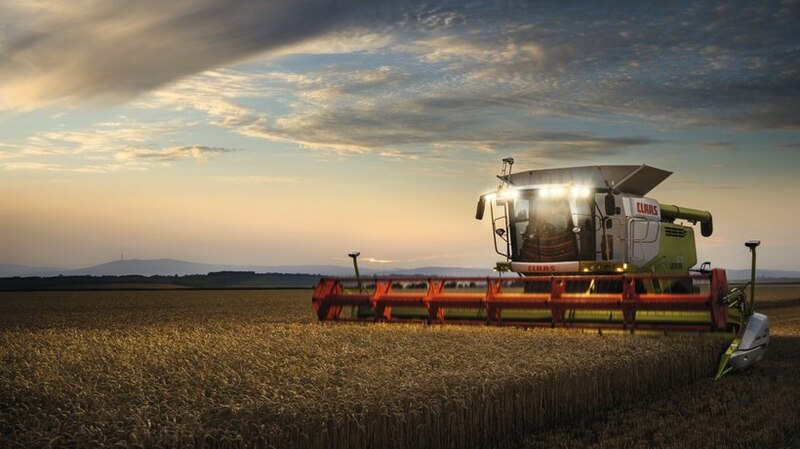 In this way, the LEXION is able to spread straw efficiently using minimal energy – even under such unfavourable conditions as extremely high straw volumes, differing degrees of straw moisture, strong crosswinds or sloping terrain.